We have set up a plant to do the process of packing and freezing our fresh durian. For fresh durian packaging, cleanliness and hygiene are always our top priority to ensure the product quality. We also have received all the necessary certificates from the government departments and authorities in order to be a frozen durian supplier Malaysia (supplier durian beku). 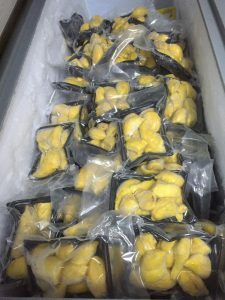 In order to maintain the product quality and extend the shelf life of durian, all products will need to go through a vacuum process to remove air around the durian flesh and then seal them in an impermeable package before delivering to consumers.